Narrow-Petal Green Champa is a woody climber with fragrant flowers borne in hooked inflorescence. Leaves are elliptic-ovate, papery, shortly tapering at tip, base pointed to shortly narrowed, both surfaces shining, hairless. 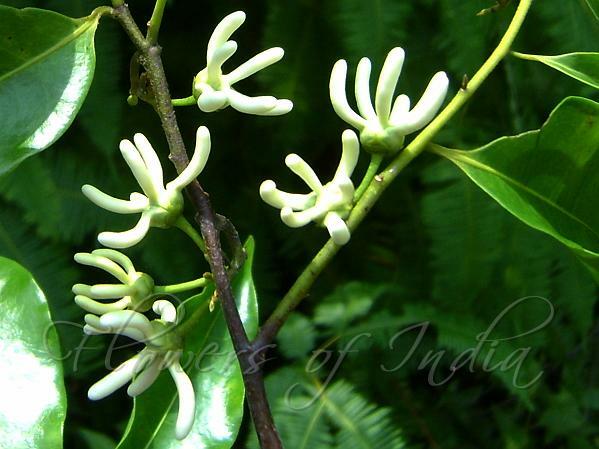 Inflorescence arise extra-in leaf-axils, flower-cluster-stalk woody, hooked, thick, up to 3 cm long, 3-10 flowered. Flowers are creamy-white; petals fleshy, fragrant, round or cylindrical, arranged in two whorls of 3 each, similar, creamy white; outer petals minutely woolly, clawed, claws round, free, hairless inside, limbs round, slender, tip blunt, slightly incurved; inner petals similar to outer petals, claws united. Fruits oblong to ellipsoid, stalkless. 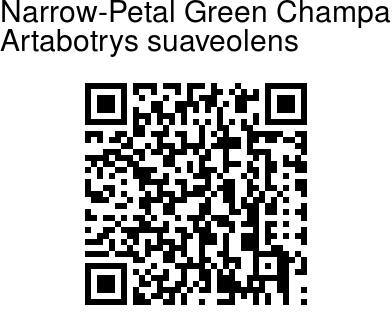 Narrow-Petal Green Champa is found in Great Nicobar Island, Bangladesh, Burma, Thailand, Peninsular Malaysia, Sumatra, Java, Borneo, Celebes, Philippines, Moluccas, New Guinea. Flowering: March-June. Medicinal uses: The decoction of leaves is useful in cholera.